Controversy erupted in Indian Wells. No. 1 seed Djokovic crushed No. 12 Milos Raonic, a 6-foot-5 (1.96-meter) Canadian, 6-2, 6-0 in 1 hour, 17 minutes on Sunday for his third straight BNP Paribas Open title and record fifth overall. No. 1 seed Williams, playing in her first Indian Wells final since a racially charged incident 15 years ago, committed 33 unforced errors and lost to No. 13 Victoria Azarenka of Belarus 6-4, 6-4. Before the finals, tournament director Ray Moore criticized women's tennis. "In my next life when I come back, I want to be someone in the WTA, because they ride on the coattails of the men," said Moore, a 69-year-old former player from South Africa. "They don't make any decisions, and they are lucky. They are very, very lucky. "If I was a lady player, I'd go down every night on my knees and thank God that Roger Federer and Rafael Nadal were born, because they have carried this sport. They really have." During ESPN's telecast, commentator Patrick McEnroe called for Moore to step down. "That was completely unacceptable," McEnroe fumed. "I'm livid." Djokovic broke the hard-serving Raonic, playing in his first tournament since suffering a thigh injury in the semifinals of the Australian Open in late January, five times. "He's the best returner probably of all time," said Raonic, who was treated for an undisclosed injury after the first set. Djokovic improved to 22-1 this year, losing only to Feliciano Lopez in the Dubai quarterfinals last month. Even then, Djokovic retired with an eye infection and severe allergy after dropping the first set 6-3. Djokovic went 82-6 last year, and only a loss to Stan Wawrinka in the French Open final prevented him from achieving the first calendar-year Grand Slam since 1969. Raonic went undefeated in the now-defunct SAP Open in San Jose, winning the last three titles (2011-13). Williams for her second Indian Wells title. 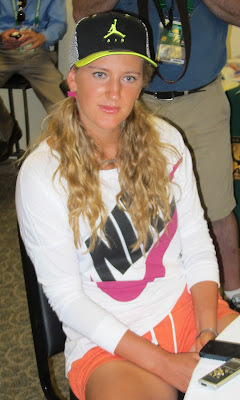 Azarenka, a former world No. 1 who is rebounding from injuries, returned to the top 10 for the first time since August 2014. She rose seven spots to No. 8. Williams and Azarenka have won four of the last six Bank of the West Classic titles at Stanford. Williams triumphed in 2011, 2012 and 2014 and Azarenka in 2010. Williams was jeered while beating Kim Clijsters in the 2001 final for her second Indian Wells title after her older sister, Venus, had withdrawn minutes before their scheduled semifinal. The crowd, suspecting the sisters didn't want to play each other, booed loudly, and their father, Richard, said he heard racial slurs. Serena vowed never to return but finally did last year, and Venus came back this year. "Obviously, the last time I was (in the final) was probably the worst moment of my whole career," Serena, 34, told reporters. "Not probably. Sure. To be back out there, which I never thought I would be, was really different and special. I was overwhelmed with emotions and nerves." It was the third straight tournament in which Williams suffered a stunning upset on a big occasion. Two victories from earning the first women's calendar-year Grand Slam, she lost to then-No. 43 Roberta Vinci of Italy in the semifinals of the U.S. Open. Trying to tie Steffi Graf for second place with 22 career Grand Slam singles titles, Williams fell to Angelique Kerber in the Australian Open final. Williams had been 4-0 against Vinci without surrendering more than four games in a set, 5-1 against Kerber with a four-match winning streak and 17-3 against Azarenka with a five-match winning streak. After Sunday's final, Williams condemned Moore's remarks. "I don't think any woman should be down on their knees thanking anybody like that," she said. "I think Venus, myself, a number of players -- if I could tell you every day how many people say they don't watch tennis unless they're watching myself or my sister -- I couldn't even bring up that number. So I don't think that is a very accurate statement. "I think there is a lot of women out there who are very exciting to watch. I think there are a lot of men out there who are exciting to watch. I think it definitely goes both ways. I think those remarks are very much mistaken and very, very, very inaccurate." "I made comments about the WTA that were in extremely poor taste and erroneous," he said. "I am truly sorry for those remarks, and apologize to all the players and WTA as a whole. We had a women's final today that reflects the strength of the players, especially Serena and Victoria, and the entire WTA." Djokovic, responding to Moore's comments, argued that men deserve more prize money than women. Djokovic and Azarenka, who also won the BNP title in 2012, each pocketed $1,028,300. "I think that our men's tennis world, ATP world, should fight for more because the stats are showing that we have much more spectators," Djokovic said. "I think that's one of the reasons why maybe we should get awarded more. "Women should fight for what they think they deserve, and we should fight for what we think we deserve. ... "
Djokovic added that he has "tremendous respect" for female athletes and is "completely for women power."